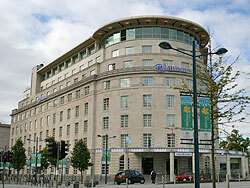 The Cardiff Hilton is situated alongside Cardiff Castle and directly opposite the Civic Centre. This 5-star landmark hotel contains just short of 200 rooms, all of which are equipped with the most modern facilities. There is a public bar and restaurant, a fitness room, sauna, steam room and spa, as well as 2 beauty rooms. Situated in the heart of Cardiff city centre. All rooms have high-speed internet access. Wi-Fi available in public areas. Modern Welsh cuisine at Razzi restaurant and drinks/tapas at the Steam bar. 7 meeting rooms for between 16-350 people.